Kolea also known as Plauvialis dominica is about eleven inches and has gold spotting and is brown with darker brown below. 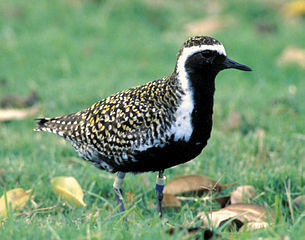 It is sometimes mistaken for the more rare Black-bellied Plover that lacks the golden color on its back. It is very hard to tell the males from the female Kolea. They are found primarily in mudflats, fields and grassy slopes. They scurrry along in search of snails, insects, and crustaceans.